Around 350 A.D., Polynesians from the Marquesas Islands set sail on voyaging canoes and settled in the Hawaiian Islands. Each canoe accommodated 12 to 15 people. Animals and plants were brought for the long voyage as well as a new agricultural beginning. 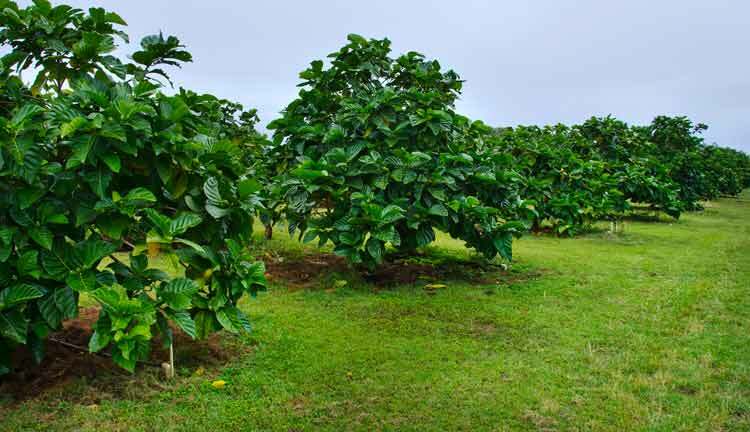 Medicinal plants included the noni tree, which bears about 50 flowers per bud, and grows into a creamy white fruit. At the time, all parts of the plant were used in homesteading and to cure ailments and disease. The College of Tropical Agriculture and Human Resources at the University of Hawaii, Manoa, lists traditional ways in which noni was used. Meat was wrapped in the wide, glossy leaves and cooked, or the leaves were made into a tea to treat malaria, reduce fever, or act as a pain reliever. A poultice was applied for tuberculosis, sprains, deep bruising, rheumatism, fever, stings from stonefish, bone fractures, and dislocations. The stem was used in canoe parts, paddles, axe and adze handles. Stems were also used as digging sticks, firewood, and made into a red pigment used to dye clothing. Seeds were used as a scalp insecticide and insect repellent; flowers for sties, and roots were used for carving or made into a yellow pigment. Although the ancient Hawaiians didn’t know it then, research indicates that the ripe fruit contains 165 beneficial compounds. They did know it was effective, and used to cure sores or scabs around or in the mouth, as a sore throat gargle (mashed), for peeling or cracking of the toes and feet (crushed), body or intestinal worms, cuts, wounds, abscesses, mouth and gum infections, toothaches, and as an appetite and brain stimulant. polio, rheumatism, severed fingers, sinus, and in veterinary medicine. Yet the website Noni Research lists clinical studies dating back to 1990. 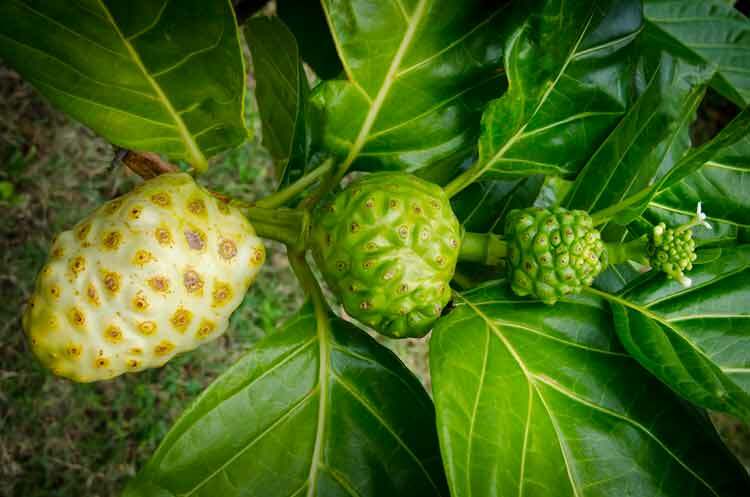 These reports conclude that noni has no adverse health effects, even at very high doses. It has been proven to calm and relax, relieve stress and anxiety, and improve mood and sense of well-being. Noni also lowers blood pressure, is anti-inflammatory, improves overall energy, shortens exercise recovery time, lowers total cholesterol and triglyceride levels, protects the liver, and helps to maintain appropriate blood glucose levels. A study published in Acta Pharmacologica Sinica found that noni is 75 percent as strong as morphine, with no toxic side effects. Most people drink pre-made noni juice which is made by taking the whole, ripe fruit and fermenting it in large, glass jars. Liquid seeps from the eyes of the fruit, and a daily shot is all you need. Sometimes it’s blended with grape or blueberry juice to make it taste better. 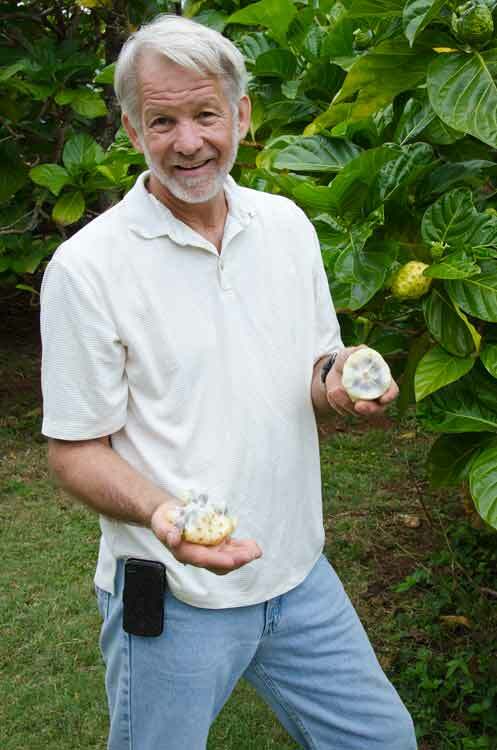 Steve is a certified organic farmer on Kauai, and owner of Hawaiian Health Ohana. He has been growing thousands of noni trees on his 20-acre property since 1981. The sustainable property generates 75 percent of its energy through windmills and solar panels. Water for food-processing comes from a well, Frailey makes and uses compost, fertilizes with foliar spray, and uses no-till methods to preserve biological activity in the soil. This entry was posted in Food Warrior Interns, On the Farm and tagged food warriors, hawaii, Hawaiian Health Ohana, marta lane, noni, Real Time Farms. Bookmark the permalink. We make pure unfermented noni juice by freezing the ripe noni and filtering the juice from the thawed seeds/pulp. We bottle it and keep it refrigerated until consumed. We have a native small noni growing wild here on the island of Cebu, Philippines. We have been able to get seeds of the large fruited Hawaii noni and are growing it here also. 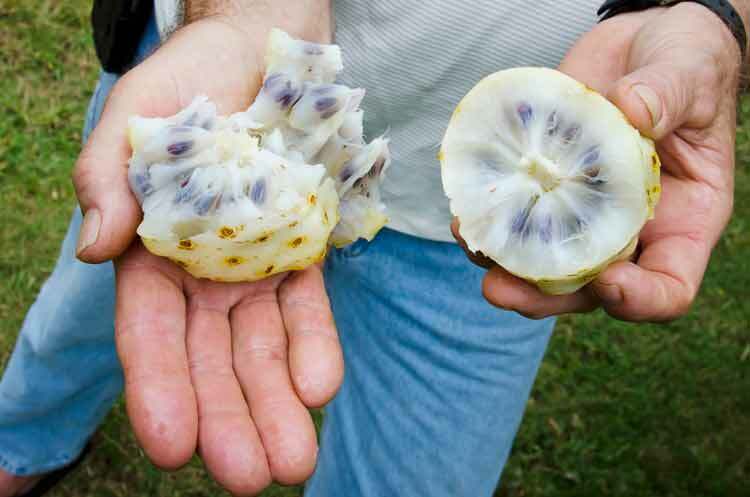 The local noni does not produce as much juice by weight as the large noni. We are growing other medicinal fruit here on the islands of Cebu and Panglao.